I would like to thank each and every one of you who read my (somewhat long) account of what is going on with my son Graham. I would really like to thank those of you who left lovely and thoughtful comments. I am blown away by your kindness. So, am I thanking you all by calling you cheeseballs? No, I’m thanking you by making cheeseballs. Now, banish the thoughts of those processed, artificially colored, pre-rolled in stale nuts cheese balls you probably have seen in the cheese section of your local grocery store. This recipe comes to you by way of Martha Stewart, so you know there is nothing processed, artificial, or stale here. This is actually an ingenious recipe. First, you make a base of cream cheese and butter with some seasonings and then you take that base and make it into three different flavored balls. One has cheddar cheese and chutney and is rolled in dried cranberries, one has blue cheese and brandy and is rolled in chopped walnuts, and one has goat cheese and scallions and is rolled in chopped parsley. It is a bit of work and you make a huge mess (or, at least I did) but you get a lot for your effort. 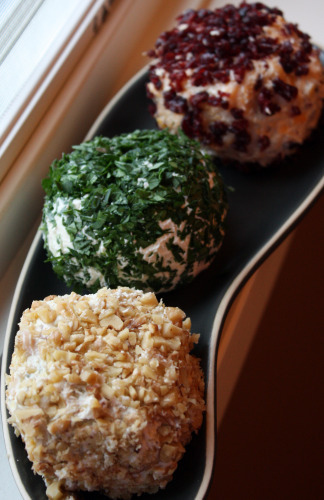 The first time I made this appetizer I was stunned by how gi-normous each cheese ball was. So, I divided each one in half to make two balls of each flavor, six balls in all. I served one of each and froze the rest for another time. It was great to be able to pull out something so special for impromptu dinners and one of the smaller balls will still easily feed 8 people or more. That method is how I have done it every time since and is how I recommend you do it, unless you are planning a party for 100. I love having things like this in the freezer. Again friends, thank you. It is a less lonely journey with friends to accompany you. You may not know this, and you may not care, but Worcestershire sauce is not vegetarian. It contains anchovies. You can find a vegan version at Whole Foods and it comes in handy when making Caesar Salad. 1. Put the butter, cream cheese, lemon juice, Worcestershire sauce, hot sauce, salt and pepper into the bowl of an electric mixer fitted with the paddle attachment; mix on medium speed until combined. Divide equally among 3 medium bowls. 2. Stir the Cheddar and chutney with the base mixture in the first bowl. Form into a ball. If not using immediately, refrigerate for up to 3 days or freeze for up to 1 month. 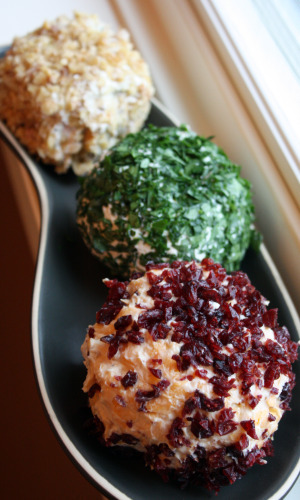 Roll the cheese ball in the cranberries to coat before serving. 3. Stir the Roquefort and shallot with the base mixture in the second bowl; add brandy, if desired. Form into a ball. If not using immediately, refrigerate for up to 3 days or freeze for up to 1 month. Roll in the walnuts to coat before serving. 4. Stir the goat cheese and scallions with the base in the remaining bowl. Form into a ball. If not using immediately, refrigerate for up to 3 days or freeze for up to 1 month. Roll in the parsley before serving. I’ve been waiting for this recipe! It will be a definite on my next party menu. I am SO making these for my next party! I really like the plate the cheese balls are on! :) I’m always looking for cool and unusual serve ware, and that is pretty awesome! Dana, I love these cheese balls! I pulled some recipes similar to these from a magazine last winter, but I haven’t made them yet. Guess what? I’m tossing those recipes and bookmarking these. I love the cranberry/cheddar version- how it’s a sweet treat among the savory. These must make a stunning and colorful presentation at a party. That little plate is VERY cool, too. I catered a wedding a couple of weeks ago and I made cheese balls as one of the finger foods… well, I would have never been able to anticipate their overwhelming success! See, I would have thought that the asiago and caramelised onion tartlets would have been the most popular… but nope, these little cheese truffles just flew off the trays! I love making cheese balls. Always popular at parties. Great picture. This will make a fantastic plate at parties. Thanks for such a great recipe! Yum! Yum! Yum! I will have to make these for my next party. Also, I had no idea about worcestershire sauce. I did know it wasn’t vegan, but thought it was still vegetarian…. good to know! Great idea for parties! Thanks! Absolutely great idea for entertaining! Great pictures as well. These are beautiful cheeseballs! Good to know about cutting the recipe (or cheeseballs) in half too. I love make-ahead appetizers like this. Ooo Dana these look so good! I had no idea you could freeze something like this. That definitely helps make entertaining easier. Plus they look so delicious. I love all the recipes you share! these look amazing and i LOVE how youve plated them! bookmarked! mmm… i love cheeseballs! i’ll have to try these at my next party. Serve these with small pretzel sticks centered in the center of each lil ball. Presentation is admirable.